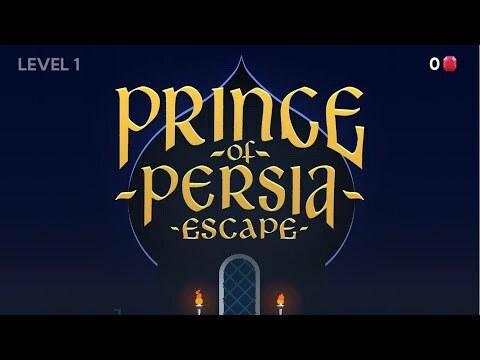 Prince Of Persia: Escape is a runner game published by Ketchapp and could be downloaded for PC or MAC and today guys, we will make a review of this old-school gaming classic. And believe me back in 1989 this game played on the first computers was a total crusher. So stay with us and let`s see if this remake can do the work. Prince Of Persia: Escape basically is a simple platform game focused on running and umping with simple controls. Prince of Persia is a franchise that needs no special introduction. Thanks to legendary 1989 original, a seminal masterpiece of the platformer genre, as well as a bunch of sequels and reboots it spawned over the years, Prince of Persia belongs to that elite group of games popular with the players of virtually all generations. But unfortunately, this game form the franchise fails miserably. If you remember, the original game had a well-elaborated story concerning a Grand Vizier Jaffar who just staged a coup, a kidnapped Sultan’s daughter and a nameless Prince who has only an hour to brave a deathtrap palace dungeon and rescue the princess before she perishes from Jaffar’s hand. In any case, we at least knew why prince risked his precious neck and that, if he just managed to avoid being impaled on some rusty pike, he’ll be awarded a half of kingdom and an obligatory princess’s hand in marriage. But this game can`t offer something like that. This game feels just like an ordinary runner game and it has no soul. There is no excitement or thrill while playing this game. And this is something that can`t be allowed in a franchise like that one. And now let`s talk about the gameplay of Prince Of Persia: Escape. As I said the controls are pretty simple and this game is easy to play. The prince is running automatically and you just need to tap on the screen to make the prince jump – short tap for regular jump and extended tap for long jumps. The prince is skillful in parkour and so he’ll easily scale even the steepest wall. Unfortunately, that will be about it as far as action is concerned. The armed palace guards who were sent to stop your progress in the first Prince of Persia are completely omitted from this version of the game – a damn shame because duels with them were some of the high points of the original. Why? Because every duel was like a strategy minigame and it was pretty hard. What can I say – Prince Of Persia: Escape is something that I wish to be far more fulfilling and entertaining. The graphics are ok and resembles the old classic game in a way but still pretty uninspiring. The level design itself is exceedingly monotonous. It seems that every level takes place in the same dreary dungeon with floating platforms and haphazardly spread booby-traps in form of protruding spikes and loose tiles aimed to send you to your death. Nothing new about that. This is a brave try to bring to life an old classic game, but it failed miserably. What can I say? It is a shame for this old classic game.